Robert Massoud is Palestinian-Canadian. In 2004, he founded Zatoun, Fair Trade olive oil from Palestine to serve as a symbol of light, hope and peace in North America. The oil is available mostly through faith communities, the grassroots and fair trade network. 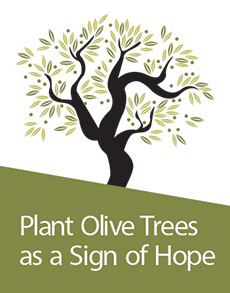 Zatoun also initiated a worldwide project called Trees for Life – Planting Peace in Palestine, to plant 10,000 olive trees every year in Palestine. Zatoun is also a major supporter of Project Hope providing “art as therapy” to help heal many thousands of children living in refugee camps in Palestine. Since 2004, Zatoun has contributed almost $450,000 to these two projects. The Event takes place on February 16, 2018 from 10:00Am till Noon on the first floor of the Minnesota Church Center, 122 West Franklin Ave, Minneapolis MN. Arguing (through maps and visuals) that the two-state solution is dead and gone and that, in fact, one state – an apartheid state – already exists between the Mediterranean and the Jordan River, he goes on to outline what a democratic, bi-national state – the only remain just solution – might look like, and what obstacles it faces from Israel, the international community and even among Palestinians themselves. Jeff Halper is an Israeli anthropologist, the former head of the Israeli Committee Against House Demolitions (ICAHD) and the Coordinator of the War Against the People project of The People Yes! Network (TPYN). A well-known activist, he has also taught at universities in Israel, the US, Latin America and Africa. Among his academic and political writings are Between Redemption and Revival: The Jewish Yishuv in Jerusalem in the Nineteenth Century (Westview, 1991); Obstacles to Peace, a resource manual of articles and maps on the Israeli/Palestinian conflict, published by ICAHD; An Israeli in Palestine (London: Pluto Press, 2008); and his latest book, War Amongst the People: Israel, the Palestinians and Global Pacification (Pluto Press/University of Chicago, 2015). Jeff participated in the first (and successful) attempt of the Free Gaza Movement to break the Israeli siege by sailing into Gaza in 2008. He serves on international support committee of the Bertrand Russell Tribunal on Palestine, and was nominated by the American Friends Service Committee for the 2006 Nobel Peace Prize, together with the Palestinian intellectual and activist Ghassan Andoni. co-sponsored by First United Church Of Christ Northfield, the Mission and Justice Committee of Bethel Lutheran Church Northfield and the MICAH group of the Northfield United Methodist Church. This conference aims to provide an often unheard perspective on the conflict in Palestine and Israel. Featured speakers are Mark Braverman, Nathan Stock and Jennifer Bing. It is our hope that these presentations will bring a new sense of insight and critical awareness to the understanding of the the underlying issues. Speaker Bios are attached. General registration is $40; students $10. However, NJP wants to make the Conference as accessible as possible to as many people as possible. For scholarship information, contact Jenny Hartley @ info@njpmn.org. Jennifer Bing: No Way to Treat a Child Jennifer Bing has worked with AFSC’s Palestine-Israel Program since 1989. She directs the Chicago AFSC Middle East Program and works with the Israel-Palestine joint U.S. program. Jennifer coordinates AFSC’s education and advocacy work on the campaign Israeli Military Detention: No Way to Treat a Child. In this role, she works closely with faith organizations and human rights groups throughout the U.S. Her first visit to Israel and Palestine was in 1982, as a college student on the Earlham College Great Lakes program in Jerusalem. She returned later to work at the Ramallah Friends Schools, where she lived for three years during the first Palestinian intifada (uprising). She has since led and participated in delegations to the Middle East, most recently in 2015. Prior to AFSC, Jennifer worked as a volunteer teacher at the Ramallah Friends School in the West Bank, as a researcher on child rights with Save the Children, and a coordinator of seminars with Gene Sharp and the Program on Nonviolent Sanctions at the Center for International Affairs at Harvard University. Jennifer is a Quaker and an active member of the Quaker Palestine Israel Network. Mark Braverman is a Jewish American with family roots in Jerusalem. He has written and lectured on the theological and interfaith issues related to the search for peace in Israel and Palestine and has been closely involved in the growth of the international church movement for Palestinian rights. In his writing and speaking Mark focuses on the role of religious beliefs and theology in the current discourse and the function of interfaith relations in the current search for just peace. Mark serves on the advisory board of Friends of Sabeel North America and was on the Board of the Israeli Committee Against House Demolitions-USA from 2007-2011. He is a cofounder of Friends of Tent of Nations North America, a nonprofit dedicated to supporting Palestinian land rights in historic Palestine. In 2011 he was instrumental in the founding of Kairos USA, a movement to unify and mobilize American Christians to take a prophetic stance for a justice for Palestinians. Mark is the author of Fatal Embrace: Christians, Jews, and the Search for Peace in the Holy Land (Beaufort Books, 2011), A wall in Jerusalem: Hope, healing, and the struggle for peace in Israel and Palestine, (Jericho Books, 2013), and recent journal articles on the kairos movement and prophetic theology. His writing, blogs, and sermons can be found at www.markbraverman.org. the Palestinian political system and to assert Palestinian sovereignty via international fora. programming to monitor and advance political solutions to the Syrian civil war.